Syllabus of the Online Course (Subject): Organisation for the Harmonisation of Business Law in Africa (OHADA). Note: Uniform Acts are only available in French. Example of the Online Course - Organisation for the Harmonisation of Business Law in Africa (OHADA). Description of the Online Course: Organisation for the Harmonisation of Business Law in Africa (OHADA). 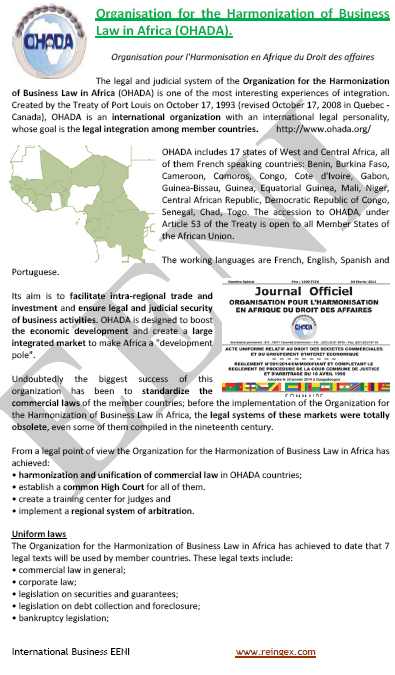 The Organisation for the Harmonisation of Business Law in Africa (OHADA) facilitates legal security (commercial law harmonisation) in relations between companies (Foreign Trade, Investment FDI). The Organisation for the Harmonisation of Business Law in Africa (OHADA) belongs to African Civilisation.